When Jason first saw Lake Titicaca on the map of Peru all those months ago, he giggled like a schoolboy and said that we had to go there. It definitely has a name that makes us all laugh and the joke is not lost on the locals. The lake is shared by Peru and Bolivia…Peru says the first half of the lake is Peruvian and the last half is Bolivian…Bolivia, of course, says exactly the opposite. It is the highest altitude navigable lake in the world. 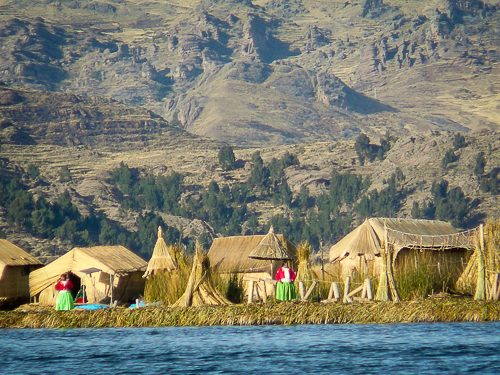 It is home to the ‘Floating Reed Islands of Uros’. It is home to Taquile Island, famous for knitting and weaving. We took a day long tour to see the best that the lake had to offer. I was somewhat hesitant to visit the reed islands as I knew that they would be very touristy. But with the adage that ‘it has to be touristy for a reason’, we thought we’d have a look. Turns out the islands are touristy, but the inhabitants are so enthusiastic and proud of their homes, that it was all worth it. We were first greeted by the island presidents wife, Francesca (the president was out fishing for the day and so could not greet us himself). She showed us to a small seating area and proceeded, with our guide as interpreter, to demonstrate how the islands were built. It was a well practiced routine, yet she was enthusiastic and played back and forth with our guide. She explained that the islands were built to avoid incoming conquerors. They now number more than 40 islands each housing 7-10 families. The roots of the torta reed are used to make the base of the islands and the rest of the reed is used to top the islands, creating a spongy, floating mass that can withstand an amazing amount of weight. After the demonstration, each of the women on the island took a group back to their homes to show us around. Francesca proudly showed us around her cozy one room home. She then pulled out some traditional clothing and offered to help us dress. It was fun to try the clothes on and I can see how they stay warm as the costume was made of wool and quite heavy. Our tour of the floating islands finished with a ride in a traditional reed boat. As we were rowed around the small harbor we got a closer look at some of the neighboring islands. It seems that ‘keeping up with the Jones’ is just as prevalent here as it is at home…each island had bigger and better homes, or more elaborate structures to show off to the tourists…a funny realization here in the ‘middle of nowhere’. Then we were off, further into the lake, to Taquile Island. 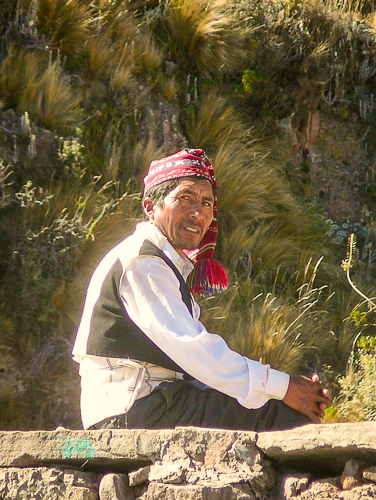 The people of Taquile Island are world renowned for their knitting and weaving. UNESCO has recognized their work as some of the best in the world and inhabitants have traveled around the world teaching and displaying their wares. It is the men of the island who knit, and they do it as naturally as having an ice cream. They can be seen, in traditional dress, walking and knitting, talking and knitting, drinking and knitting…always with their wool and needles in their hands…it’s a little strange quite frankly. Apparently boys learn to knit as young as 5 or 6 and then perfect their craft as they grow. The results are beautiful and are as perfect and ornate as machine knit fabric. The women of the island weave and their work is as beautiful as the mens’ knitting. The colors and scenes are amazing and the artistic quality is evident. I had been admiring Peruvian textiles since arriving and decided that there could not be a better place to invest in a piece. We found a traditional woven mens belt depicting scenes from the island – it will look great framed on our wall when we return. 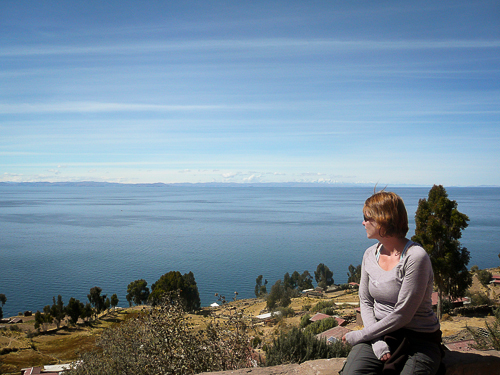 So, now we can giggle and say that we have visited Lake Titicaca. It was a great day…I’m glad we didn’t let the touristy nature of it keep us away. I have did a lot of knitting, and planing on getting back into it here in Bulgaria. It is a nice creative hobby. 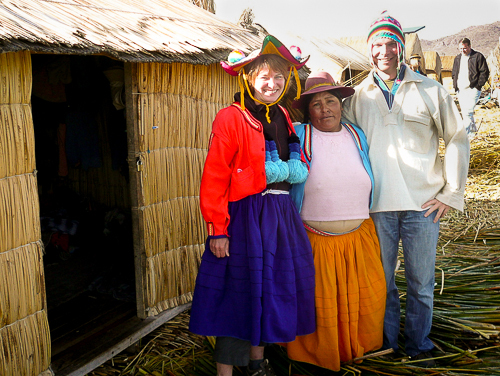 Though touristy, I also was captured by the beauty of Uros and Tquile Islands and their affinity with nature. 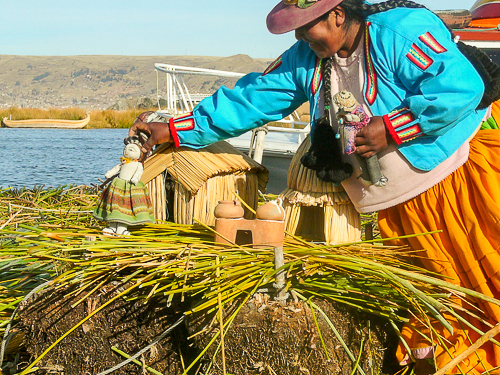 I like the idea that Uros has to be regularly renewed with the old reeds at the bottom rotting away and new dried ones being placed on top. They simply pick their houses up and move them if the need to.